One fraud discovery left unattended leads to many more fraud discoveries. 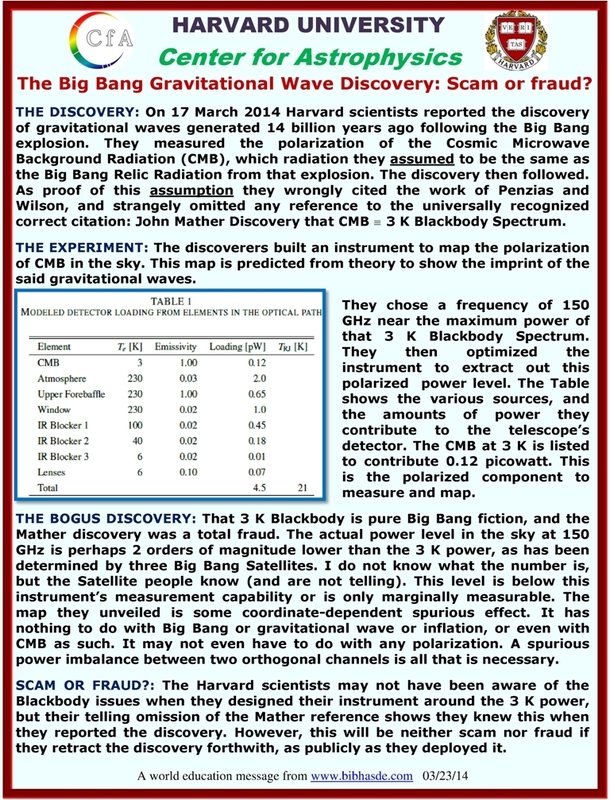 One fraud discovery deep sixed makes possible many more fraud discoveries. UPDATE 04/12/14: They are proceeding with the discovery as though it were fully enshrined! Harvard is in an awful hurry with their discovery – they must be working that 2015 Nobel schedule for John Kovac! I have not seen anything from CalTech or Stanford President yet on their guys. 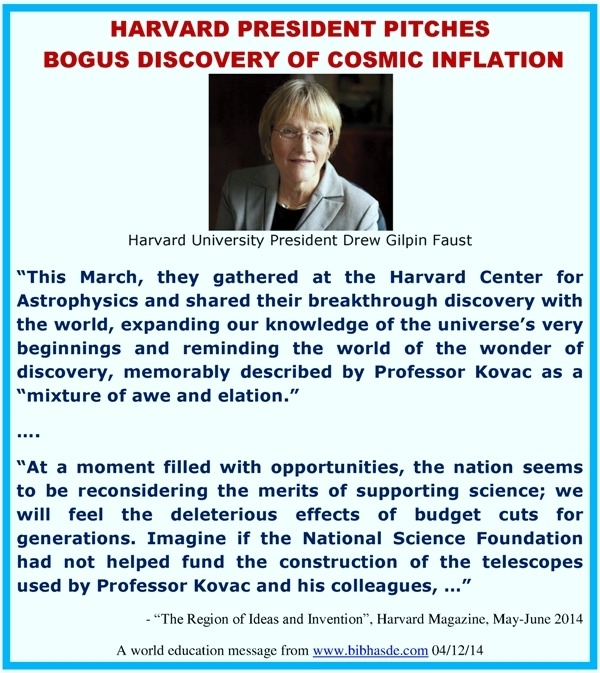 Harvard President Faust is not even waiting for the planned scientific confirmations! These will undo this “discovery” for sure – and most insiders know that for sure. When that happens, President Faust should fire some butts, for putting her in this situation. I cannot understand how this spectacular weirdorama of a totally bogus scientific discovery can be made into anything else by quickly deploying it with powerful establishment endorsements – quickly before it melts. Melt it will – President Faust or no President Faust. What we are looking at here with the Bicep2 Flash Boys is just COBE Satellite: The Next Generation. Does President Faust know that every expert scientific commentary in the media on this discovery begins with the caveat “If correct,…”, “If confirmed, …”. Does she know that she is the only one averring that this discovery is a done deal? Has anyone ever wondered why, in certain very significant quarters, there is total silence over this grand discovery? Verrry interesting! 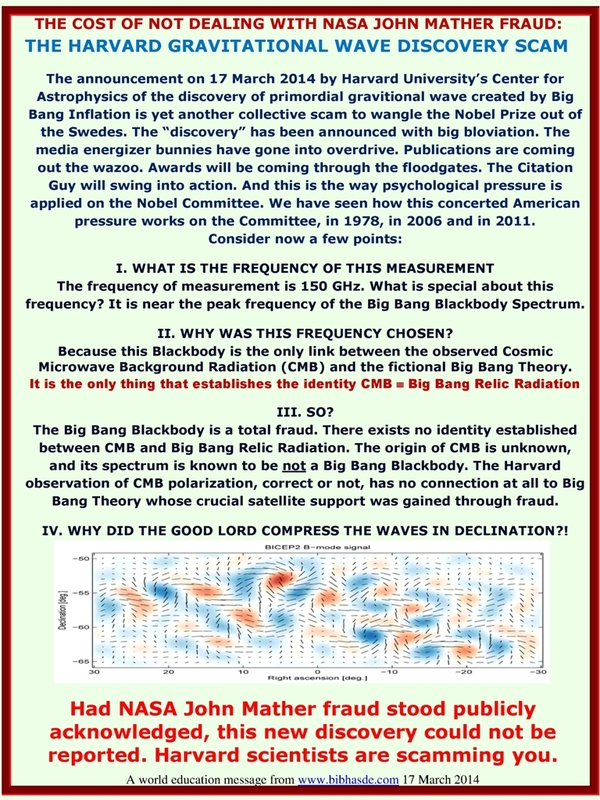 This entry was posted on March 25, 2014 at 4:04 pm and is filed under Advancing physics in the Age of Fakery, NASA's COBE Satellite fraud, Physicists play citizens pay, Uncategorized. You can follow any responses to this entry through the RSS 2.0 feed. You can leave a response, or trackback from your own site.